Cyrtandra is a large genus of as many as 600 species, which are mainly shrubs or lignescent herbs, sometimes small trees. The northernmost outlier of the genus is C. umbellifera (Southern Ryukyo Islands, Taiwan, Philippines). Centres of diversity are Borneo, New Guinea and the Pacific Islands. 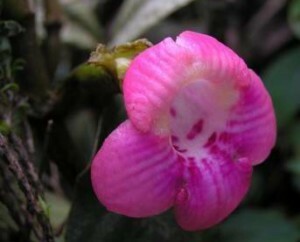 Cyrtandra is the largest genus of Gesneriaceae and the genus with widest distribution in the Old World. The main distinctive character is the indehiscent fruit, which is hard as stone (sclerocarpous) predominantly in the Western species and soft-fleshy (a true berry) in the eastern (Pacific) species. A conspicuous anatomical character of many species is the presence of sclereids (osteo- and/or astrosclereids) in the hypodermis and mesophyll of the leaves. There is a continuous range from iso- to extreme anisophylly (the smaller leaf of a pair being reduced to a tiny, triangular scale, e.g., C. dispar, C. baileyi). In the inflorescences the flowers are usually densely aggregated, and the bracteoles are sometimes enlarged and fused to form a conspicuous cup. Sometimes the flowers are placed at the ground by the elongation and downcurving of the peduncle or emerge from the soil in that the elongated cyme is buried in the ground (geoflory; some species from Borneo and Sulawesi, e.g., C. rhizantha). The usually light-coloured flowers indicate melittophily (bee pollination); species with red or reddish flower colour (e.g., C. clarkei) are possibly ornithophilous (pollinated by birds). Nothing is known about the dispersal of the sclerocarpous fruits, while the fleshy berries are clearly bird-dispersed. Cyrtandra is polymorphic throughout its range and species delimitation is very difficult. Especially in the Hawaiian Islands variation is extreme. This led St. John (Phytologia 63-65: 1987-1988) to describe more than 250 new species, while a more realistic total species number in Hawaii is around 60. The extreme polymorphism is the result of extensive interspecific, and usually intersectional, hybridisation (Wagner & al. 1990, Smith & al. 1995). A natural subdivision has not been achieved yet. Clarke (1883) subdivided the genus (with 157 species then known) into two subgenera and 13 sections.